Because downtime is not an option for MultiPlan, the company required a robust UPS offering the highest level of availability, coupled with scalability and efficiency. The multi-faceted 9395 proved to be the ideal fit for MultiPlan, meeting all of its requirements and more. 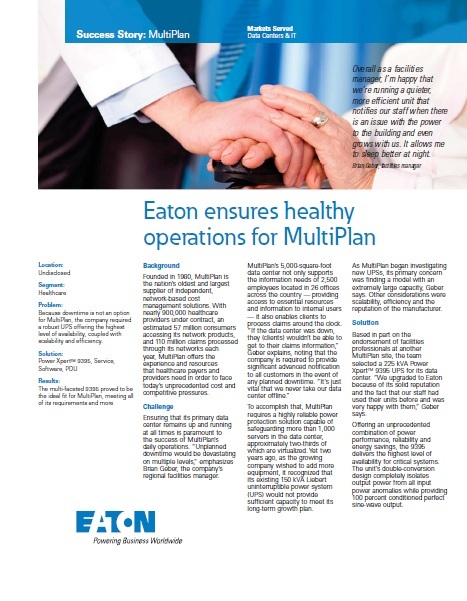 MultiPlan, the nation's oldest and largest supplier of independent, network-based cost management solutions, required a highly reliable power protection solution capable of safeguarding more than 1,000 servers in the data center, approximately two-thirds of which are virtualized. In addition to extemely large capacity, the healthcare company included scalability, efficiency and the reputation of the manufacturer in its considerations for finding the right solution. Based in part on the endorsement of facilities professionals at another MultiPlan site, the team selected a 225 kVA Power Xpert 9395 UPS for its data center. After completing the capacity upgrade, MultiPlan also purchased a pair of 75 kVA Eaton PDUs for reliable data center power distribution for both raised and non-raised floor applications.